May 19, 2010: Kamloops to Salmon Arm. The ride started off with a quick downhill out of the city. I was riding on the highway shoulder with a concrete wall to my right and traffic to my left. Up ahead I saw a huge orange construction sign blocking the whole shoulder. I was about to go around it but habit and instinct kicked in. I checked behind me and saw a tractor-trailer within “run me over” distance. It’s a good thing my brakes work. Road construction is irritating. Riding past the town of Chase I experienced a heavy dust cloud kicked up by a dump truck directly in front of me. I had limited visibility going through it. If there was any immediate traffic I would have stopped for the dust to settle down before continuing. I met some more cyclists on the road to Salmon Arm. Godfrey and Natalie were riding to Kamloops from Revelstoke (I think). We talked for a bit about our bikes. He looked over my bike and I checked out his. I asked Godfrey how he liked his recumbent. He said it was good on flat terrain and in headwinds but going up hills is somewhat challenging. Turns out we both carry the exact same Ortlieb waterproof panniers. My first taste of rain was about 10 km from Salmon Arm. It started off as a sprinkle but then turned into a full fledged heavy shower. I was already smelly and sweaty from my day’s ride so I opted not to put on my rain jacket. I arrived into town soaking wet yet feeling great. I chose to stay at a motel to dry off for the night. Hungry after a day’s ride and sick of eating granola and energy bars I headed over to the local grocery store to pick up some food including 200 grams of honey ham that I ate almost immediately. 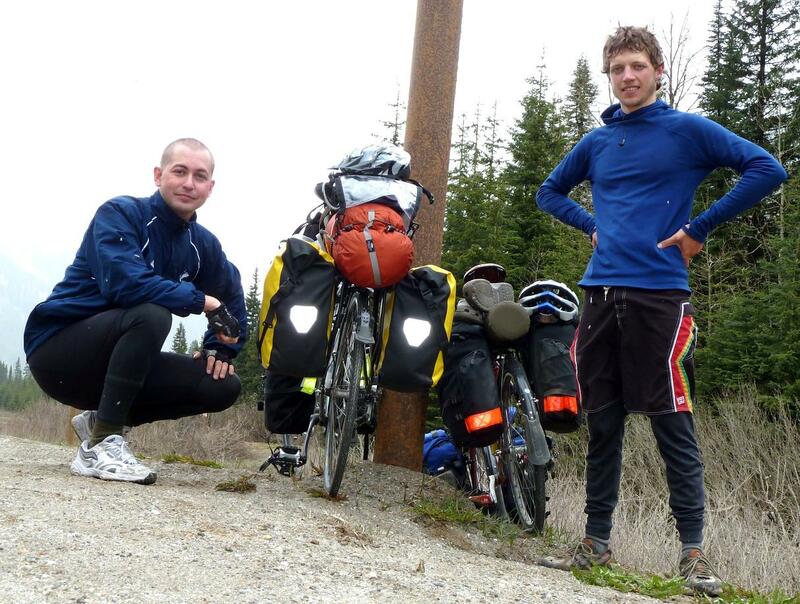 May 20, 2010: Salmon Arm to Revelstoke. The next day’s ride from Salmon Arm to Revelstoke was troublesome. While riding I experienced a really bad shimmy in my bike. I though it was from uneven weight distribution from my panniers. However, after checking my rear wheel I found that eight of my spokes were really loose. So loose that I could probably flick at them and play a tune just like on a guitar. It was then that I met other cyclists headed to Revelstoke. Gary stopped to check up and see if I was okay. I told him the situation and that I would do what I could to fix else I’ll hitch a ride back into Salmon Arm. I tightened the spokes up to a point I where thought I could ride it out. However, the wheel was so out of alignment I had to hitch a ride back into town. After about 10 minutes a pickup truck stopped to give me a lift. I threw my bike in the back and off I went. The driver’s name was Drew. He lived in Revelstoke and was on his way to Salmon Arm to drop off his friend’s truck. I couldn’t help but notice the crack in the truck’s windshield. His plan was to drop off the truck and hitchhike back home to Revelstoke. Gary’s reason for picking me up was part “karma”. He hoped it would be easier for him to hitch back home. Turns out he runs a bed and breakfast called Grumpy Bear Lodge with his girlfriend. I considered the option of staying there for the night in appreciation for his help. Back in Salmon Arm, it only took less then 30 minutes for the spokes to be tightened and trued. I wanted to hitch a ride out to my last spot of cycling. It was not easy to hitch in town so I biked out past Canoe and gave it the old thumbs up. About a half hour later a pickup truck came by and off I went. Paul was from Calgary where he ran his own stained glass window business. I had to put my bike carefully in the back as he had a finished product for delivery. His truck also had a cracked windshield. 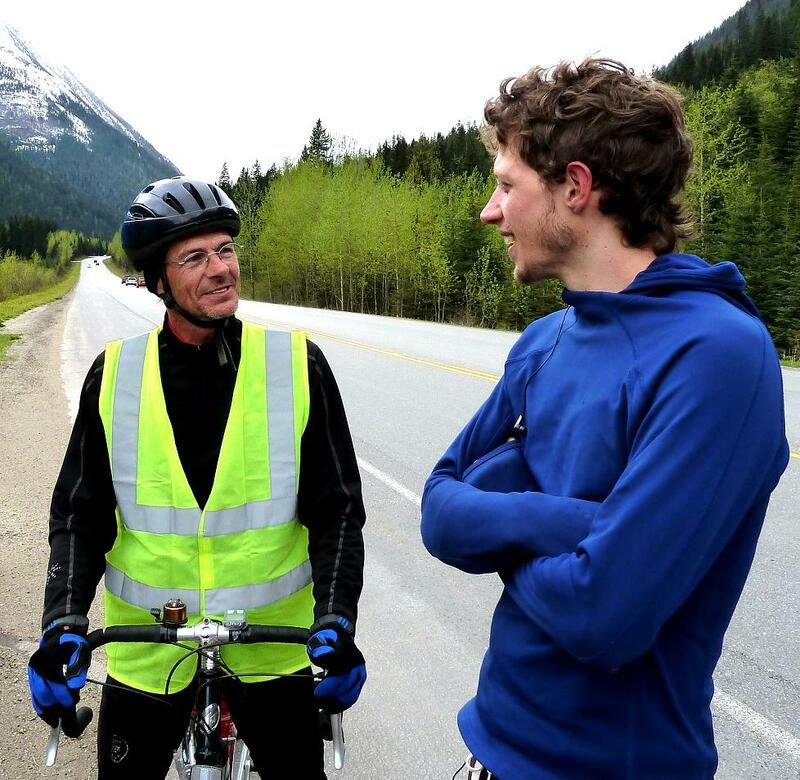 We chatted for a while then he dropped me off so I could continue my cycling into Revelstoke. There was something off from my ride into town. It was a toss up between staying a Drew’s lodge or the local hostel in Revelstoke. I was checking out locations on my BlackBerry’s Google maps app when Gary, whom I met on the road earlier that day, cycled up beside me with his cycling partner Nan. Turns out Gary is cycling to Nova Scotia for charity. 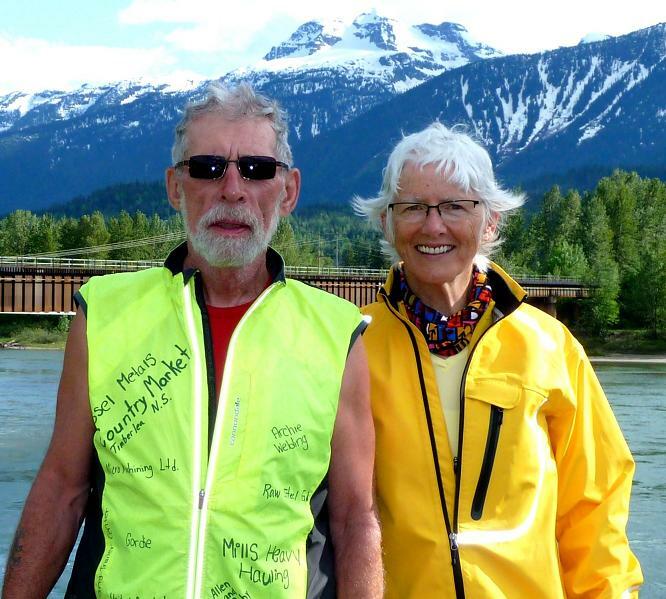 And Nan is someone Gary bumped into along the way from Salmon Arm. She’s only doing the day’s ride to Revelstoke then heading back home. It’s her pre-training for her own cross Canada trip starting at the end of June. We all had dinner together before settling in and calling it a night. Nan and I stayed at a hostel while Gary had a contact for a place to stay. I noticed Gary’s bike is light. He had no front panniers and had limited clothing including only one pair of cycling sandals for his clip-on pedals. If it got cold he would just put on socks. If it rained he would take them off. A retired trucker, Gary keeps things simple and knows all about going the distance. Late that night I had the realization that I was dropped off too far towards Revelstoke after my bike repair. 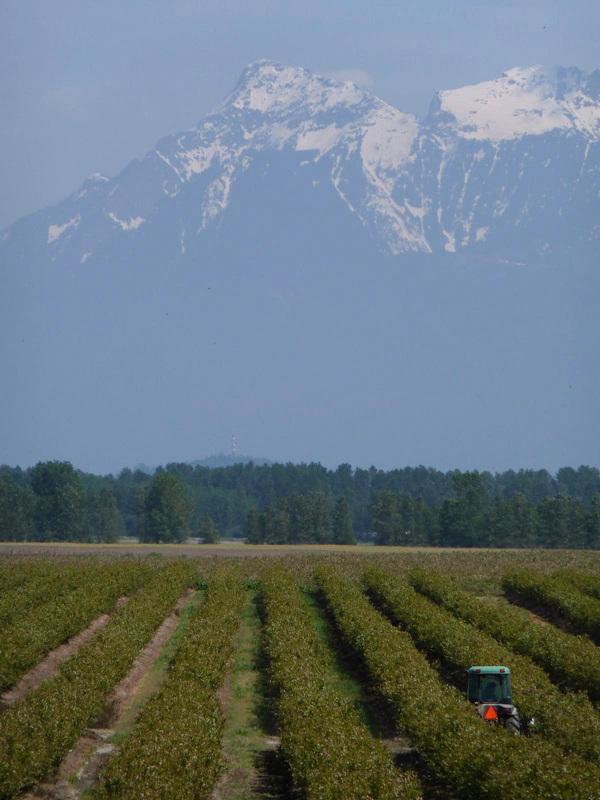 May 21, 2010: Back to Revelstoke. 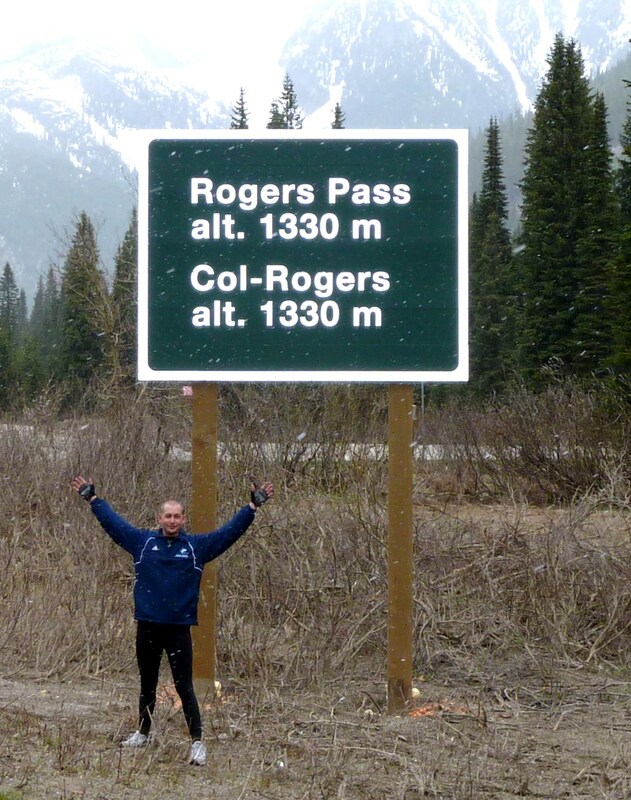 I should have been on the road towards Golden biking up 1330 metres through Rogers Pass. Instead I decided to get back out towards Salmon Arm to cover the distance I should have covered the day before. I hitched a ride from a resident of Revelstoke. His name was Noble and lived up to that name very well. He drove a nice SUV with a small crack in his windshield (notice a pattern?). Noble was retired but still worked to make some fun money. He offered me a place to stay for the night once I bike back into Revelstoke. Another nice gesture from a stranger. Thank you again, Noble. On my way back into Revelstoke I meet up with Nan traveling back home to Salmon Arm. She was really shocked to see me since she thought I moved onwards to Golden that morning. I did have to stay the night again in Revelstoke since the distance to Golden was 150 km. Trusting my instincts and intuition I opted for the same hostel as the night before. It was there I met Julian who shared the same dorm room. He is bicycling to Hamilton and we’re both gear geeks. 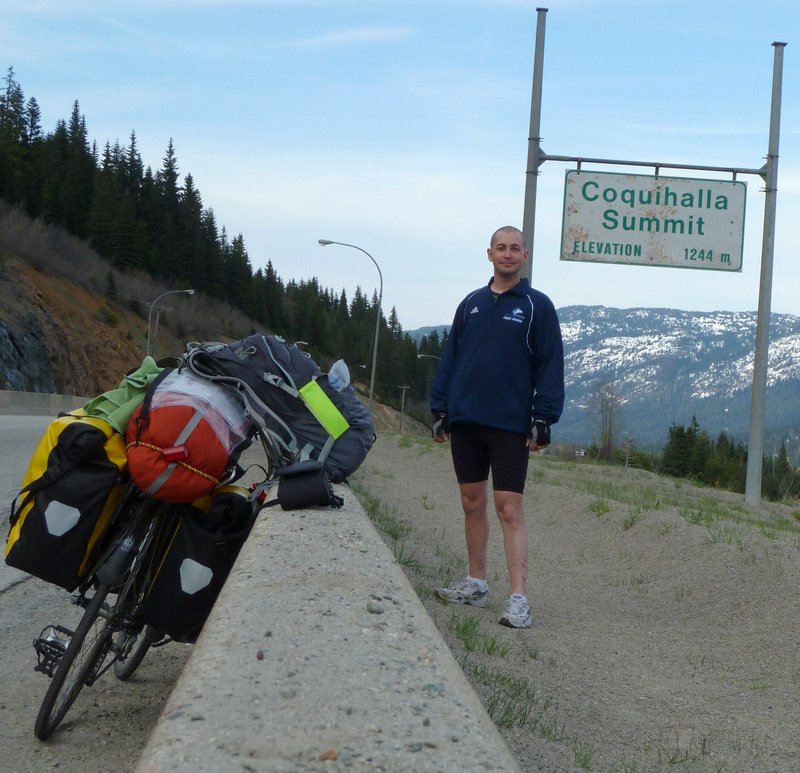 May 22, 2010: Revelstoke to Golden. We both headed out to Golden going through where everyone says is the toughest part of the trip, Rogers Pass. I started off slow since I was riding uphill out of town first thing in the morning when my legs aren’t warmed up yet. The road eventually turned into a gradual ascent. I was leading the way with Julian close behind. Or was it Julian behind to pressure me forward. Conversing with someone during the ride made the time go by faster. We talked about bikes, camping gear etc. At one point Julian asked about my suspension seat post. I told him it made the ride more comfortable. “You need it, old man” was his reply. Wow! being called an “old man” by a 23 year old and I’m only in my early 30’s. I thought it was funny. I kept chuckling to myself for the next little while. The comment did help to provide some level of motivation. While taking a meal break we heard the rumblings of a train. It was coming out of the Mount Macdonald Tunnel. We took some video and photos of it from track level. When the train left a cyclist rode up to us. 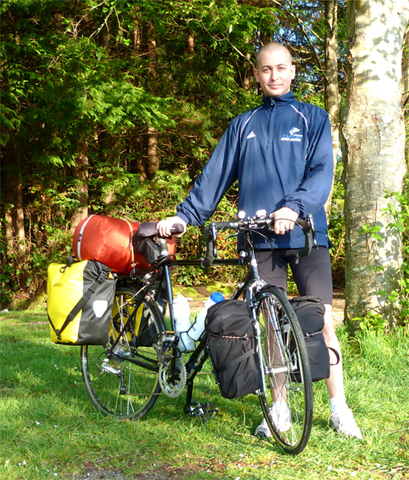 Daniel lives in Alymer, QC and is doing his own solo bike trek across Canada. An experienced cyclist, he’s done many tours including one with over 2000 cyclists. Imagine that many cyclists coming into a town where the population is only about five hundred people. Do you remember where you parked your bike or where your tent is? Dan iel is not using panniers. He’s prefers the BOB Yak bike carrier which takes the weight off the back wheel and distributes it onto the carrier. At the top of Rogers Pass there’s a lodge and restaurant. We agreed to meet Daniel there for lunch. We made it!! 1330 metres at the summit and its snowing. The ride up was gradual and I felt it was a little too easy. I have to say, my rides from Ucluelet to Port Alberni and Hope to Merritt were a lot harder. Julian and I gave each other a high five then stopped to take photos. We met up with Daniel for lunch then headed down the mountain towards Golden. Even though I taped over the vents in my helmet to block out the cold wind, I opted to wear my winter toque for the ride down. It was a FAST descent from Rogers Pass. Faster than from my Day 1 ride from Ucluelet on Vancouver Island. What a rush! We rode through three avalanche tunnels. The first was not lighted. I relied on the red blinking seat light on Julian’s bike as my guide. As long as I followed that I’d be okay. It was a long way to Golden. We were informed that “it was all downhill” from the top of the pass. Wrong! The day wore on with 150 km of biking. Julian and I arrived into Golden at 6:30 pm….err…7:30 pm. Oh that’s right! We’re in another time zone. We managed to stay at a hostel as the only guests. May 23rd, 2010: Golden to Lake Louise. There’s was rain forecast for the day. Fortunately, Julian and I biked between two areas of rain clouds. We were at the same pace as the weather moving through the region. We could see the rain clouds in front of us and behind us. Halfway through our trip we stopped for coffee in a town called Field to relax for a bit. It was maybe a half hour later Mother Nature reminded us to get moving or be humbled with the rain. Unfortunately, Daniel the cyclist we met the other day, was not so lucky. He left earlier and rode most of the way in the rain. Hello Alberta! Kicking Horse Pass divides both provinces. I felt a small sense of accomplishment leaving British Columbia. I started the trip in a province with all those hills, a little rain, snow flurries, wind, cold and too much weight on my bike (I mailed home at least 13 lbs of kit I don’t need). I’ll miss the majestic views of the mountains and ice blue rivers carrying glacier water runoff. Surprisingly, I didn’t see any significant wildlife. I was only ten minutes in Alberta where in one field off the highway I saw elk grazing, a grizzly bear running along the train tracks and a black bear in the woods. Did I mention my camera has over 12x zoom? Julian and I stayed at the HI hostel in Lake Louise. It had a ski chalet type feel. They had an in-house pub, in dorm washrooms and sauna. I enjoyed a celebratory glass of red wine to mark a successful journey to date. Daniel was there too and we talked about the day’s ride. He told us about all the rain he had. Exactly how many times can he swear in French about the rain and cold? Enough times for me to use the exact same word on my next steep uphill, taber..! May 24, 2010. I parted ways with my riding buddy, Julian. He was headed to Banff to meet a friend and could enjoy the luxury of sleeping in. I was headed to Canmore, a short 85 km away. I did take my time in the morning leaving Lake Louise at almost 10:45 am, first mailing out another 3 lbs of kit I don’t need. Factoring in my lighter bike and stronger legs I sped along Hwy 1A. There were so many Deer and Elk on the side of the road I could almost reach out and touch them with my hand. I stopped off in Banff thinking of taking a break maybe even having a latte. Just when I was contemplating going straight to Canmore I assisted some picnickers for their group photo. I talked with them for a bit and told them about my ride. They offered me a egg salad sandwich, yummy. Thanks, Cory. Then Julian came in behind me. He saw my yellow panniers and hung out for a bit. We both went to Starbucks in town for a latte. We parted ways one last time. It was good to ride with him. Especially through Rogers Pass and Kicking Horse Pass where I didn’t have cell reception (Fido/Rogers). He did have reception with his network, Telus. Julian had the right attitude, the right sense of humour and the right desire for a latte break when needed. Everything was fun for him. If there was a time he wasn’t having fun, he’d stop and eat a chocolate bar. What a great idea! FYI, The local government is building a bike lane between Canmore and Banff. I’m sure it’ll be great when completed. For now I’ll have to settle for the Trans Canada Highway. I arrived in Canmore a short while later. I did a recce of the town and found that some shops would be open on May 24th. These include coffee shops, grocery stores and bike stores. Ever since my bike spoke incident out of Salmon Arm I need to pay more attention to my back wheel. I had originally planned to take a day off in Calgary. Instead I decided to stay in Canmore for two days. May 24th, 2010: Canmore. Slept in a bit then headed to a bike shop to tighten up my spokes. Once again I’ve observed that you get more enthusiastic and better service with local or smaller scale bike shops. These guys love to bike. I spent the rest of the afternoon drinking my caramel macchaito and reading The Alchemist, cover to cover. May 25th: Off to Calgary. It was a decent first half of cycling from Vancouver to Kamloops. Leaving downtown Vancouver to Harrison Mills was a gradual incline on Hastings Street which then took me to a scenic and speedy ride down Inlet drive. I eventually ended up onto the Lougheed Highway. A nice long straight road were I was able to keep a good pace. I was fortunate to shed at least 2 kilos of unnecessary items back in Vancouver. With a lighter bike and legs that are getting accustomed to the daily grind I found it easier going uphill. Which is a good thing since back in Ucluelet I had stopped a couple of times on a hill using my legs pressed against the sharp pedals which resulted in about five cuts on my left leg. About four hours into the ride I stopped to assist two cyclists in need of a bike pump. It looked as if they were going for a casual day ride based on the gear they didn’t have. 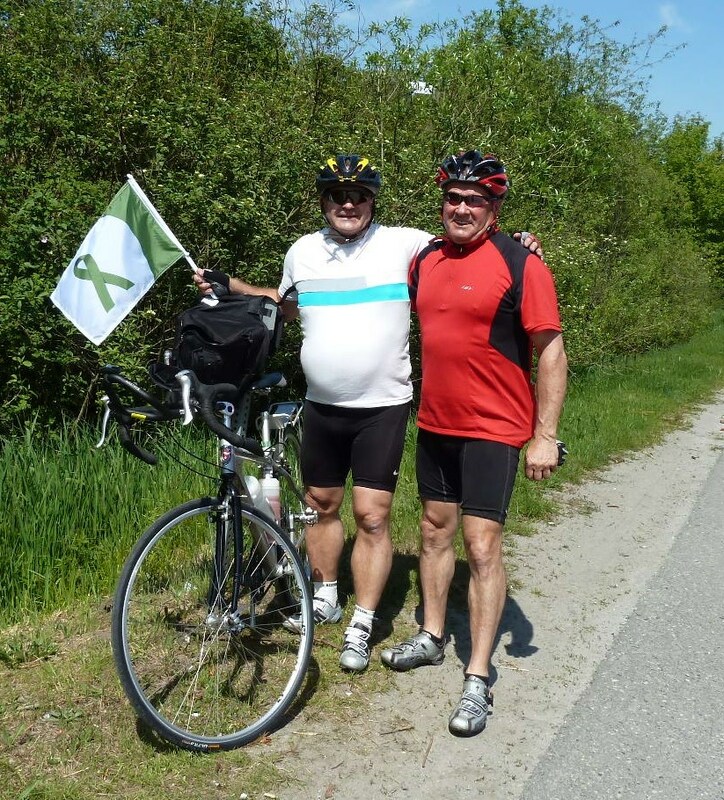 After a quick chat I discovered that André Deguise & Henri Lecompte are biking to Quebec City. They are doing their ride in support of the Canadian Cancer Society and the Canadian Association of organ donation. A chaser van is trailing them for logistical support…which made me just a little envious. I made it to my campsite at The! Campground by early afternoon. Plenty of time to take a nice hot shower, do a little laundry and relax before nightfall. This campground and the others in Harrison Mills has a train track nearby. I was woken up a few times during the night with the rumble of a freight train. It’s too early to say whether I will still enjoy camping after this trek across the nation. You wake up to condensation inside the tent, everything is damp, it is too early for the sun to peek out from the mountains and if there was sun there’s not enough time for it all to dry out. 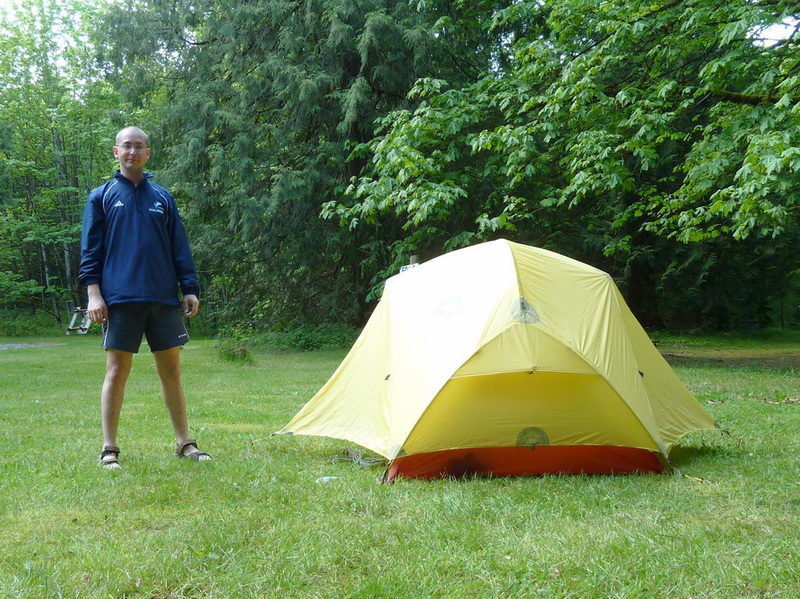 So you end up packing up your dam..err…damp tent, sleeping bag and air mattress adding more weight to your bike. Any suggestions on how to solve this? Away I go on day five. I’m pedaling, pedaling and pedaling along a very scenic route into Hope. My legs are doing well in keeping up a good pace. Then I turned a corner and saw something that I didn’t yet want to think about right away. The mountains in the distance weren’t the Rocky Mountains but they were big in my eyes. Nah! I won’t be going through there today. I’m biking through Hope and up Highway 5. A nice Highway with wide shoulders and easy hills. Wrong on both counts. Just outside of Hope I came across a man who is walking from Vancouver to New York and back again. I couldn’t believe what I was seeing. He’s pushing a shopping cart with his belongings. We exchanged greetings and snapped some pictures of each other. I even gave him some food as I wasn’t sure when was the last time he ate. Go to my “Trip Photos” section to see a picture of him. Going up Highway 5 was not what I had expected. It was up and up and up. I had originally planned to go on the Trans Canada and settle in Boston Bar for the night. However, I figured Hwy 5 was shorter to Kamloops and there was a lodge halfway between Hope and Merritt, BC. Coquihalla Summit - 1244 metres of biking, up! The ride up to Coquihalla Summit took a long time. I had to walk many parts while pushing my bike along the road. The closer I got to the summit, the colder it became. There was still snow on the ground and being in only shorts and a t-shirt I had to put on my windbreaker. It gets really breezy descending down a mountain at 60 km/hr. I didn’t have far left to go as the lodge was less than 15 km away. I was looking forward to a nice hot shower. But when I got there the place was closed with no signs of life anywhere. So what to do? Take some fast acting painkillers and just keep pedaling, pedaling and pedaling and cursing, cursing and cursing. Out of water and hungry I ended up in Merritt after dark . I was over 12 hours on the road. Not fun. The sixth day was my ride to Kamloops. I was slow and steady for the usual uphill climb but my legs were still hurting from the day before. I had to get off and walk for a few. I reached another summit of about 1225 metres. Then a long descent almost the rest of the way. Today is the seventh day and I am resting my legs. I took the day off to stock up on some granola bars, mail out some additional gear back home that I don’t need and pick up some extra screws for my racks. I had a couple of screws loosen and fall out during my ride and used up my spares. Specialty bike stores like “The Bike Doctor” in Vancouver and “Spoke Bike and Ski” here in Kamloops have my personal thanks. It’s not just these bike shops that are helping me complete this journey. I am supported by my friends whom have been my “eyes in the sky”. They double check distances and weather forecasts, called motels before my arrival to see if rooms are available (except for the lodge past Coquihalla Summit, that was my bad) and have given me encouragement either through comments on the blog, emails and/or SMS messages. Griffin Centre can’t do it alone either. They rely on the contributions of people like YOU to give generously, so that the people they serve can continue to have hope and achieve their dreams. Mental illness touches 1 in every 5 Canadians. That means you or someone you know will experience a mental illness in your lifetime. Maybe it’s affecting a teen in your neighbourhood, or even the family next door. So far we’ve reached $800 in donations. Thank you. I’m hoping after the Rocky Mountains we’ll clear two milestones, the 1000 mark in donations and kilometres traveled. Over the next five days I will have intermittent cell and GPS coverage. It’s only when I hit towns such as Salmon Arm, Revelstoke, Golden and Banff will I then be able to connect. Total distance traveled to date: 580 km. Outstanding! That’s how I can describe yesterday’s ride out of Port Alberni. It did start off like the first day with a long uphill . 😦 My legs weren’t warmed up yet so I walked it a bit. It’s very frustrating to start off slow. The downward portion took me up to speeds of 60 km/hr. Still not as fast as the other day 😉 The road conditions ended up being marginally flat where I maintained a good average pace of 25 km/hr. I was thinking that going this fast I’d get to the ferry back for the mainland in no time. I really enjoyed the scenery. At one point the highway circled a small lake surrounded by mountains. Breathtaking. I’m sure if I stopped I’d end up having a picnic and relaxing for a few hours. As tempting as that was I had to keep going. I needed to be in Vancouver by the end of the day. I had met some cyclists on the road. As is the custom, you either give a wave hello or a nod in passing. A few that I managed to talk to I had mentioned that I come from Uculuet. The “wow, you’re crazy” look on their faces was almost instant. As if they are having some sort of horrific flashback from their own ride. The highway from Parksville to Departure Bay reminded me of the 401 back in Toronto. The difference being is that this one has trees instead of condos and office buildings flanking the sides of it. There is also a bicycling lane. While cars are zipping past at 80 km/hr, I’m riding next to them on an wide paved shoulder. The BC Ferry is about a 1.5 hr ride. In some ways I wish it was longer. The ferry has lounge seating, big screen TV’s, kids play zone, cafes and various dinning areas. I found a nice comfortable spot to get some shut eye to rest up before my last push into downtown Vancouver. Total distance traveled was 100 km. My legs weren’t bad at the end of Day 2. I feel like my muscles are starting to adapt to the amount of riding I’m doing. I’m fortunate to be staying at my friend’s place whose condo building has a steam sauna and whirlpool :). He also has a cat named Spartacus who is either extremely shy or is planning to prey on me during my sleep (I’m on to you, cat!). We went out for a nice tasty burger last night. The place we went to had free drink refills so I ordered a Nestea Ice Tea. When the server dropped off my glass I joked, “see you in five minutes”. It took two more refills to satisfy my thirst. Beats drinking water all day. Today is my day off. The first two days was a good trial run to figure out what I need and don’t need to bring with me. I plan on lightening my load by at least a kilo or two. My bicycle computer is acting up and I wasn’t able to get a good reading during the last leg of my trip. Hopefully there’s a reset button else I have to get another one. I’ve taken some pictures which I will be uploading soon. Ciao. I earned myself a venti frappaccuino today. 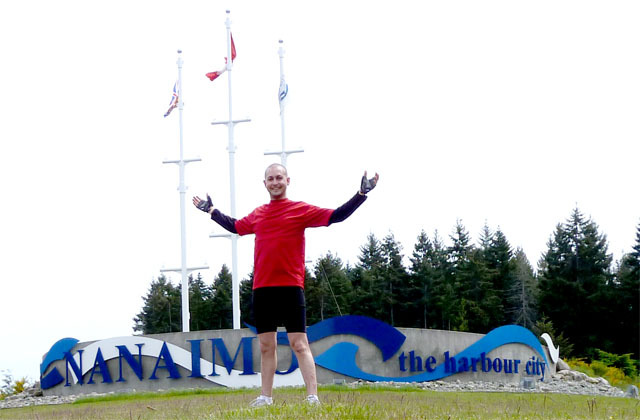 I was up early for my 100 km ride from Ucluelet to Port Alberni. The weather was nice and cool. I even had a starting song in my mp3 playlist. It was ‘Don’t Stop Believing’ by Journey. Not till after the first 10 km I realized it should have been ‘Highway To Hell’ by AC/DC. The Pacific Rim Hwy has many twists and turns with really steep hills. I suspect the engineer who designed it must have a secret passion for designing roller coasters, ha! During the ride I had the bad habit of frequently checking my odometre. The old saying goes ‘a watched pot never boils’. It psychologically slowed me down. Towards the end my legs felt like jello and my pace had slowed. I was on the road for about 9 hrs. Today is considered a small example of what to expect in the Rocky Mountains. Tomorrow will be my trip to Nanimo. It is there that I will catch the ferry back to the mainland then head into downtown Vancouver. Ciao! Off I went from Toronto to Vancouver. For my flight I had to disassemble my bike in order for it to fit in a bike box. I took off the wheels, fenders, racks, drop bar and seat. When I put it all back together I ended up with extra screws that I can use at some point during my ride. Lucky me. It is sandal wearing weather here. Perfect for a casual walk around downtown Vancouver to see the sights and the remnants of Olympic glory. I am staying with my friend whom I’ve known since senior kindergarten. Tomorrow if the weather is right we’ll be going kayaking at Deep Cove which is just slightly north of the city. The scheduled day I start cycling is the 11th. There is a theme to my journey that makes this trip all the more worthwhile. I am Going the Distance For Mental Health. I will be bicycling across Canada in support of Griffin Centre. Griffin Centre is a not-profit, charitable, mental health agency providing essential services to youth, adults and their families in Ontario. They have been helping people who thought their needs didn’t count and they continue to expand their programs and services in order to respond to the changing needs to our community. Griffin Centre’s mission is to promote positive change for vulnerable youth and adults with mental health challenges and/or developmental disabilities. They are dedicated to delivering innovative services and developing creative partnerships that enhance lives and communities. I hope my trip will inspire others to push through and strive in achieving their goals. Much in the same way that Griffin helps over 1,000 people each year to recognize their strengths, achieve their goals and improve their lives. My goal is to raise $3650 for Griffin Centre. That’s 50 cents per kilometre. Only a couple more days to go. Can’t wait. Wow, where does the time go? Over the last month I have finished up some part time coursework, moved into a new place and continued prepping for my trip. I picked up a few items needed. For starters, I bought a new bike. My old bike is fantastic. It is fast and nimble and glides effortlessly across city streets. However, it just was not designed for long-distance touring. I even contacted the manufacturer to discuss upgrading options. I could have done some upgrading but it is more beneficial to get the new bike in the long run. Pun intended. I bought my very first digital camera last weekend. It is the 12 megapixel Panasonic Lumix ZS . It is a feature-rich camera that includes manual aperture and priority settings and HD video capabilities. 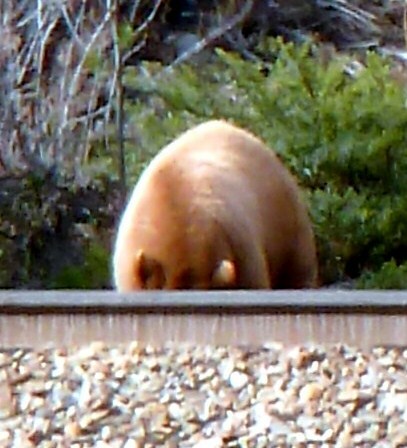 And with 12x optical zoom, I can get close to the wildlife without actually getting close to the wildlife. At one point, I was considering the Olympus Tough series. I weighed the opportunity cost and having a rugged weatherproof camera although would be an ideal choice for where I’m going, it has lower specifications. Other gear ready to go includes my MSR Hubba Hubba HP tent, Marmot sleeping bag, Therm-a-Rest air mattress and Osprey Raptor 14 hydration pack for those off the bike moments. I discovered a while back from a colleague about a new WordPress blogging application for the iPhone. They also have one for the BlackBerry. This application allows you to post and approve comments and photos on the WordPress.com blog site without the need for a separate computer, laptop or netbook. Consider today’s post a trial run. And as you may have already noticed I have GPS tracking setup. Again, from my BlackBerry. I did a test over the weekend. Having it on for 10 hours uses approximately 800 KB of data. So when you are planning your own trip consider getting a data plan from your cell provider to share you location so friends and family can keep tabs. Since my last post I stopped eating poutine and chicken wings and gained 7 lbs. How does that work? Must be the lattes. Will my Specialized Sirrus 2004 Hybrid handle the trip with updated touring wheels or do I get a new bike altogether? FYI, touring wheels have more spokes to handle the heavier load. Should I get bike panniers or use the Bob Yak carrier? Should I get the Spot GPS system, Revere Personal Locater Beacon (PLB) or use my Blackberry GPS Tracker to upload my route to the web? I did test the Blackberry GPS Tracker system but so far I couldn’t get it to work. I’m getting an error message “unable to access GPS”. Safety is my first priority. The adventure comes second. My laptop is over six years old and heavy. Should get a Netbook and tether my Blackberry to it for web access so I can update my blog? I do have a data plan with my cell phone provider. I don’t own a digital camera. Should I get a basic one that I don’t mind having it damaged during the trip or something more versatile for future use? Do I stop eating poutine and chicken wings now or work it off riding through BC? The route planning would be a simple process. Get provincial maps for each province travelling through. Mark the route taken by two or three other people who’ve done the trip before and have posted their itinerary online. Follow whatever route works or even carve your own. Allow for an average days travel of 150 km. Keep in mind the locations of camp sites, hostels and the occasional hotels (with Jacuzzi) in advance. Afterall, I don’t want to get stuck at night in the middle of nowhere without a safe place to sleep. I was also advised by my buddy G.U. that I should look into where the bike shops are just in case I need to have a tune up or major repair done.